Pieter Bruegel the Elder, 1525-1569 one of the Netherlands’s famous artists in art history. Nothing is known about his religious convictions, and nothing is known about his political affiliations. Bruegel was born in the same town as Hieronymus Bosch, and was very impressed with Bosch’s artwork. Bruegel wasn’t impressed with the Italian mathematical one point perspective. He wasn’t interested in the Renaissance style heroic art compositions either. He is however interested in landscapes and peasant life. One of Pieter Bruegel the Elder's famous paintings, "The Return of the Hunters", was painted in 1565. The subject matter of the artwork is peasant hunters returning from the hunt. The landscape opens in front of the hunters into a wide deep landscape setting. 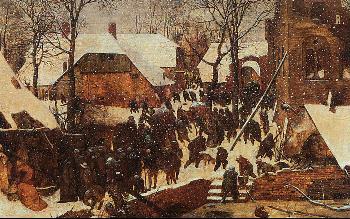 The figures themselves are dwarfed by the magnificent winter vista indicating Bruegel may have been more interested in winter scene than in the activities of the hunters themselves. Bruegel did not use a standard Italian formal one-point art perspective to create depth and figure size relationship in this painting. Instead he used two diagonal landscape parapets on the left side of the painting to gently lead the eye toward the distant mountains. In another of Bruegel's famous paintings "Peasant Wedding", 1565, Pieter Bruegel the Elder used another novel diagonal parapet of diminishing figures seated at a table to lead the eye of the viewer into the depth of the painting. The diagonal parapet wouldn't lead our eyes into the depth of the artwork at all save the bright white clothing worn by eight figures situated at intervals along the table on both sides. The viewer’s eye is led into the artwork focusing on the figure in the center wearing the brightest white clothing, then around the table to other individual figures wearing white, and back again to the starting central figure. Possibly Pieter Bruegel the Elder was influenced by Gruenwald's circle of white objects in "The Crucifixion" 1510-15, that leads the eye around and through Gruenwald’s artwork. The back wall in the "Peasant Wedding"is painted in a gradient. The right side of the wall is brightest in color, acting as a light source, and a balance for the art composition, even though there is no real light source in the painting itself. The wall gradually gets darker the farther it goes into the background creating depth of space. The logistics of creating spatial depth without a light source or the mathematical system of perspective of Pieter Bruegel's time, seems more interesting to Bruegel than the unarticulated, unemotional peasant figures. Peasant figures are again used in another of Pieter Bruegel the Elder’s famous paintings in art history, "The Blind Leading the Blind", 1568. This time, the diagonal is used to separate the foreground from the background in a one-third to two-thirds formal compositional ratio. Why Pieter Breugel the Elder uses peasants for his artistic subject matter isn't really known. Apparently he was a humanist, interested in human nature, or the quality of being human. Possibly "The Blind Leading the Blind" too, was a statement in reference to the religious reformation furor that was going on at the time. Other famous artists in art history during the Renaissance period are Jacopo Tintoretto and Giorgione. To view the entire gallery of Pieter Bruegel the Elder, click here.